Los Angeles, CA – A glittering array of new Bonus Features has been unveiled for the definitive 6-disc Blu-ray set Blake Edwards’ The Pink Panther Film Collection Starring Peter Sellers. Arriving June 27 from Shout! Factory’s Shout Select line, this new and long-awaited must-own complete collection of the classic movie comedies is available for pre-order now at Amazon.com and ShoutFactory.com. Among the spectacular set’s new Bonus Features are exclusive interviews with dazzling leading ladies Claudia Cardinale, Catherine Schell, and Lesley-Anne Down; exclusive interviews with members of Team Panther including production company chief Walter Mirisch, production designer Peter Mullins, and editor Alan Jones; two audio commentaries by author and film historian William Patrick Maynard; three audio commentaries by Jason Simos of the Peter Sellers Appreciation Society; and a 24-page book with an essay by animation historian and film critic Jerry Beck. More jewels are to be found in the extras with long-unseen stills spotlighting cast and crew as they created movie magic, culled from both studio archives and private collections, among them photographer Colin Cadle’s The Pink Panther Strikes Again on-set gallery; and vintage featurettes, TV and radio spots, and trailers including hilarious rare teasers never before available in any home entertainment issue. Also in this set are previously available extras, including audio commentary by Blake Edwards on The Pink Panther. The legendary Peter Sellers stars as the irrepressible and incompetent Inspector Jacques Clouseau in this 6-film collection, which consists of The Pink Panther (1964), A Shot in the Dark (1964), The Return of the Pink Panther (1975), The Pink Panther Strikes Again (1976), Revenge of the Pink Panther (1978), and Trail of the Pink Panther (1982), each directed by Academy Award winner Blake Edwards (Victor/Victoria, Breakfast at Tiffany’s). For the first time in any home entertainment issue, all six Clouseau comedies are available together in a single collection, with four making their debuts on Blu-ray, including A Shot in the Dark and The Pink Panther Strikes Again, both presented in new 4K scans of the interpositives. 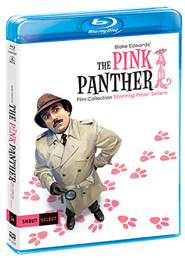 Blake Edwards’ The Pink Panther Film Collection Starring Peter Sellers is a standout release in Shout Select, a line of movie releases shining a spotlight on the essentials in film.